Instant Apps are the next step in app evolution, a universal Android solution that brings the speed and power of a native app with the ease and immediacy of a web app. They look and operate just like one of the apps that are installed on your phone, but you don’t need to download anything. So Instant Apps don’t live on my phone? Correct. Using an Instant App is similar to browsing to a web page. Once you close the window, it disappears. Yes and no. Instant Apps don’t have any technical limitations, and developers can deliver things like account signup, purchasing, and videos, just like they would in a regular app. However, Instant Apps can be specifically targeted, so a developer could choose to deliver a certain portion of their app to a user at a specific time. That would effectively “lock” the rest of the app until the user decided to download the full version. Do I need to be online to use Instant Apps? Like Progressive Web Apps, Instant Apps can be designed to work online, but some features would be accessible only when connected to a network. Can any phone run them? Pretty much. Google says phones going all the way back to Jelly Bean can run Instant Apps, though some phones may not be capable of displaying them. Setting up Instant Apps is as easy as flipping a switch. Do I need to set up anything to use them? 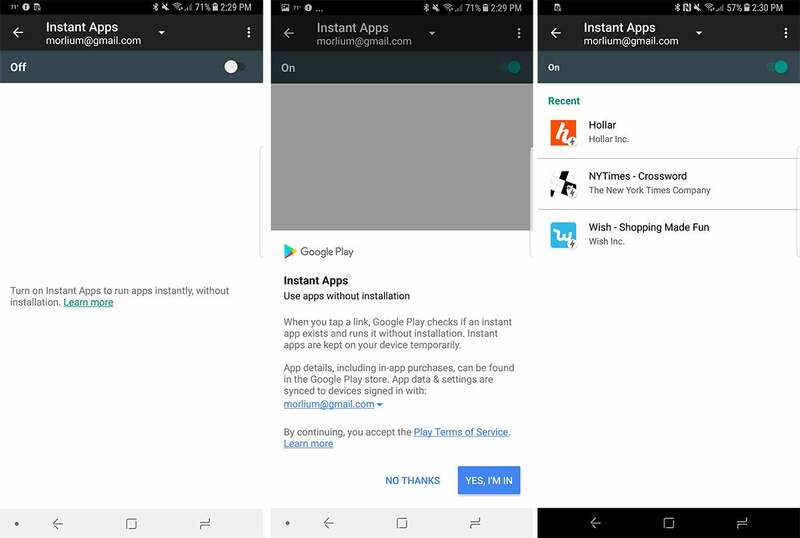 You need to enable Instant Apps for your account on your phone. Head over to your Settings app and find your Google Account settings. Scroll down to Instant Apps, flip the toggle on, and tap Yes I’m in on the next screen. How do I know I’m using an Instant App? Well, the point is that you’re not supposed to know when you’re running an Instant App. They launch just like a regular app would, and offer the same experience. But there are a couple of telltale signs. 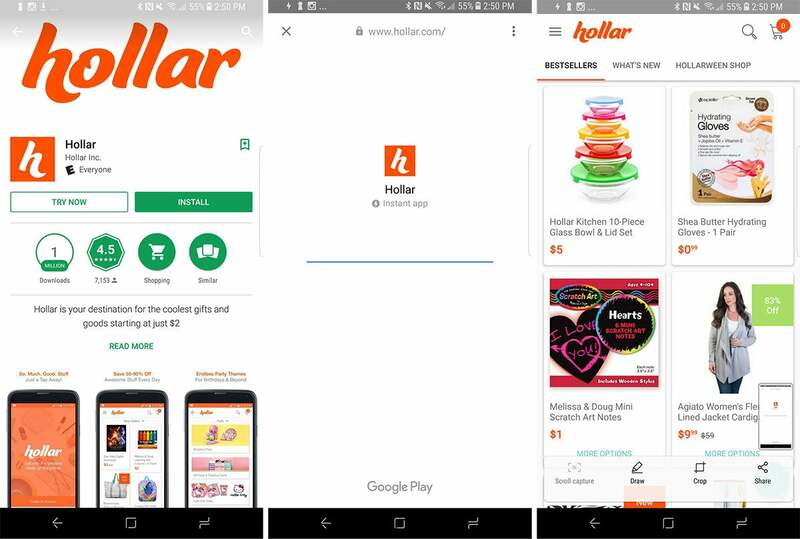 For one, most Instant Apps will include a link to download the full app at the top of the screen. Also, if you’re in a browser when you open an Instant App, the address bar will disappear when you click an "Instant" link. 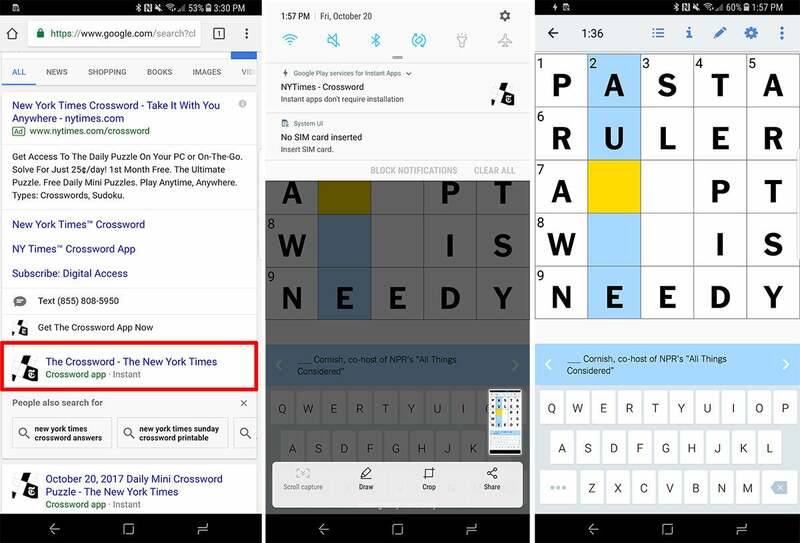 You can play the daily New York Times mini crossword puzzle as an Instant App. Can I share Instant Apps? Yes, and in fact that’s their main advantage. If you see an article you like in the Buzzfeed app, for example, you can share it with a friend and they’ll be able to launch directly into that section of the app even if they haven’t previously installed it. How do I find an Instant App? Unless you’re specifically searching for one in the Play Store, it’s actually kind of random. Someone may send you a link that opens up in an instant app, or you could do a Google search that sends you to one. To test it out, type NYT Crossword into the Chrome browser on your Android phone and tap on the result with the word “Instant” next to it. Open that link, and you’ll be taken to the New York Times Crossword app with the ability to work on today’s mini-puzzle. How do I find an Instant App in the Play Store? When you visit an app page that has an Instant App companion, there will be a Try Now button. Tap it and you’ll be taken directly to the instant app. 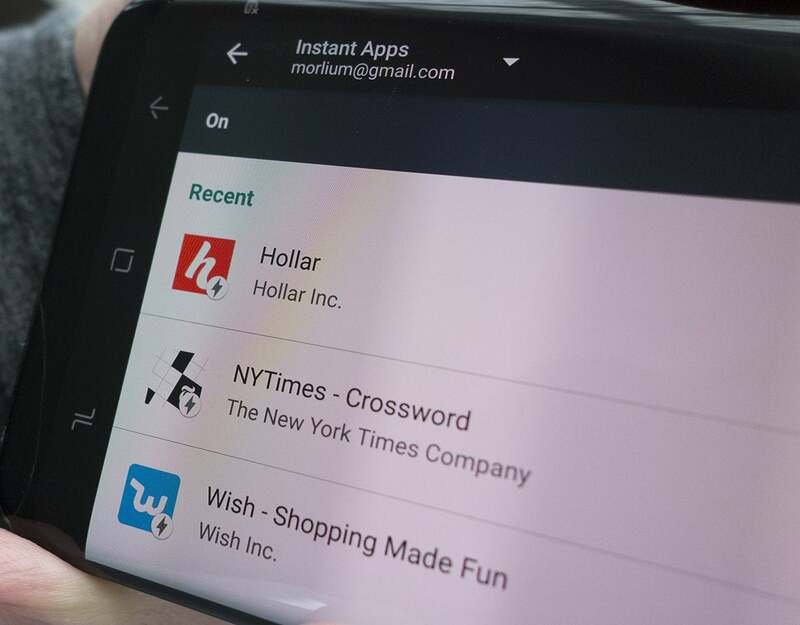 Hollar is one of the Instant Apps available to try in the Play Store. Which Instant Apps are available to try? Can I see an Instant Apps history? If you head back to the Instant Apps tab in your Google Account settings, you can see a history of the Instant Apps you’ve used.